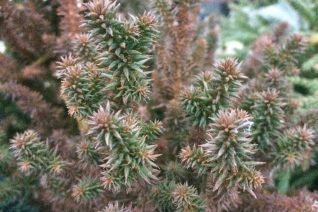 Wonderful easy to grow dwarf form of Japanese Cedar. This form has not scales but more like tiny needles. In summer the foliage is deep green. With cooler weather it takes on amazing russet tints. Very slow growing to 3′ x 2′ in 8 years. Incredibly dense growth habit gives the appearance of diligent pruning- but none is required. Extremely drought tolerant. For full sun and little summer water once established. Rock gardens, containers, gravel gardens. With or without other dwarf conifers. High deer resistance. An excellent truly long term dwarf conifer that retains its good looks.